Maybe you know him from Barnstormers, or perhaps his Please Don’t Spit on the Painting Show at Widewalls; in any event, there’s not much more I can say about Madsaki that has not been written up in Juxtapoz; and similarly on Honeyee in Japanese here (except he admits to his passionate study of art in college); and the Hickory Dickory Dock video interview; and on Hypebeast; and by Murakami here and here already; however, I can ruminate on my first impression of him at the opening of the 2016 Mark Ryden exhibit at Hidari Zingaro. At first, I thought he was just a minor graffiti artist from New York whom I had never heard of. He was very relaxed, and we had lively small talk about politics and what brought him to Japan. So although he is touted as a Japanese artist, I left with the impression that I simply talked to a hip New York street artist. His viewpoint and demeanor seem very American to me. Later reading his bio, I learned that he grew up as third culture kid, outside the bounds of typical categorizations of national identity in Japan and the US. He basically was shaped by his experience as a person of color in the US, so I can totally relate to his attitude and the style of his work. Joining Murakami has led to a rapid evolution of Madsaki that has really matured him as artist. 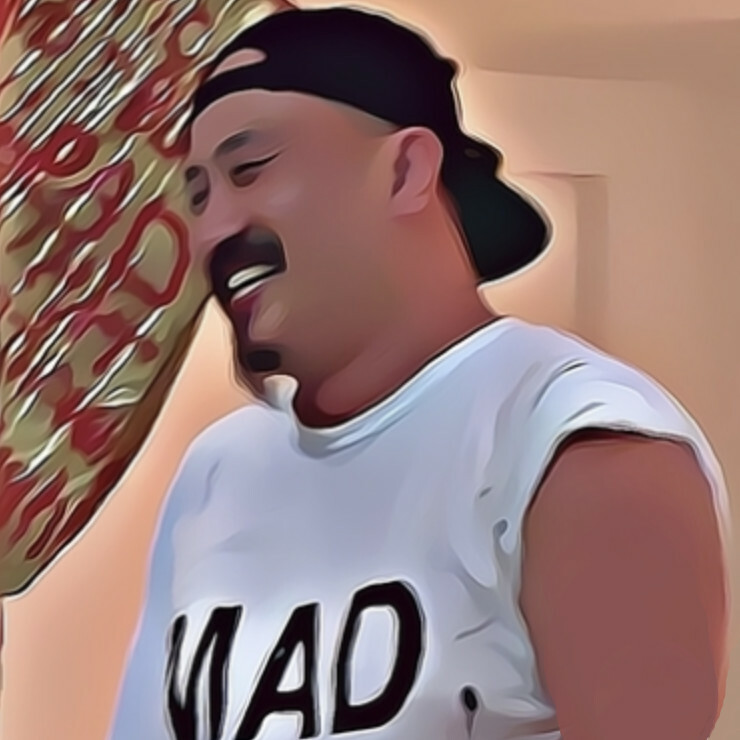 Now with three Kaikai exhibitions under his belt––Hickory Dickory Dock; Here Today, Gone Tomorrow; and MADSAKI Says “Yo! snipe1 & UFO907, Get Your Asses Over Here!” Madsaki has made a firm imprint on the Murakami canon. In his introduction to Madsaki’s second solo exhibit, Here Today, Gone Tomorrow from 2017, Murakami jokingly points out how his direction and guidance successfully shaped Madsaki’s work. While the debt Madsaki owes to Murakami is patently clear, in an abrupt turnabout it appears that the apprentice guides the master in some ways as well. Sugimoto68 will offer three significant contributions that Madsaki has made to the work of Murakami. 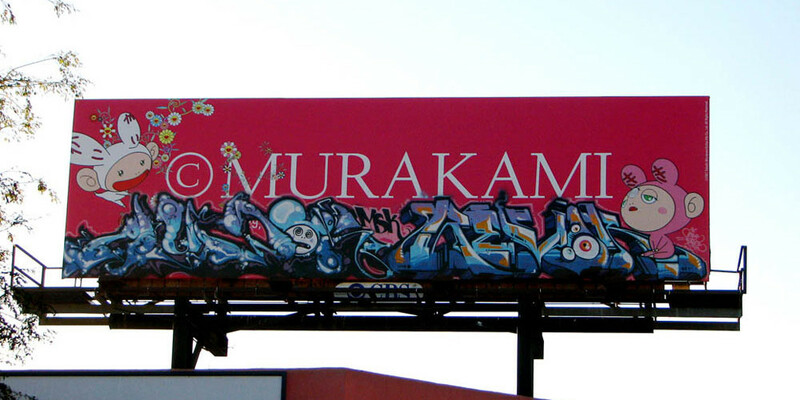 Consider the affection Murakami has had for graffiti art over the last decade or so, best evidenced by his acquisition of the Auger/Revok MOMA tagged billboard. 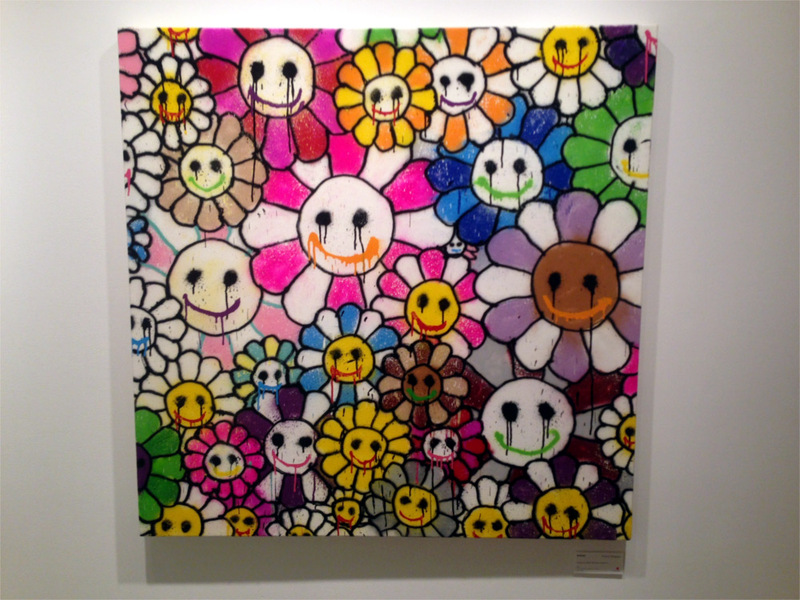 Murakami has been an avid collector and eventually developed a desire to incorporate graffiti elements in his art. For instance, Hollow and Death (2015) appear to be attempts at juxtaposing street style graffiti in his work; however, these pieces seem rather forced, clumsy and amateurish. Murakami simply “sprays” text on his flower pattern. Enter Madsaki, and suddenly Murakami’s graffiti inspired work starts to look far more street smart with 727999 (2016)—the first Murakami piece with a seamless incorporation of graffiti––accomplished with a slate-like backdrop and stylized scrawl courtesy of Madsaki. Clearly a collaboration, Madsaki’s contribution subtly alters Murakami’s iconic 727, producing a new urban masterpiece. For Madaski’s 2016 Hickory Dickory Dock show, Murakami gives Madsaki free reign to apply his copycat style to the Flower motif—as a result Madsaki gives new life to another Murakami classic. 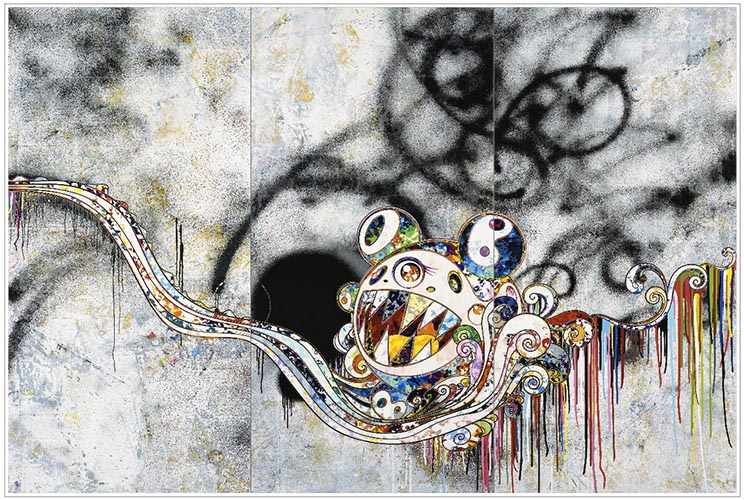 This work differs from 727999 in that it is Madasaki’s own piece, in his style, which reinterprets Murakami’s work. Homage emerges as a natural counterpoint to Flowers, with Madsaki’s “mascara streaked” yet ebullient Murakami flowers. Madsaki successfully transforms Murakami’s work. The transformation is so complete that Murakami releases the design as a new print the following year. 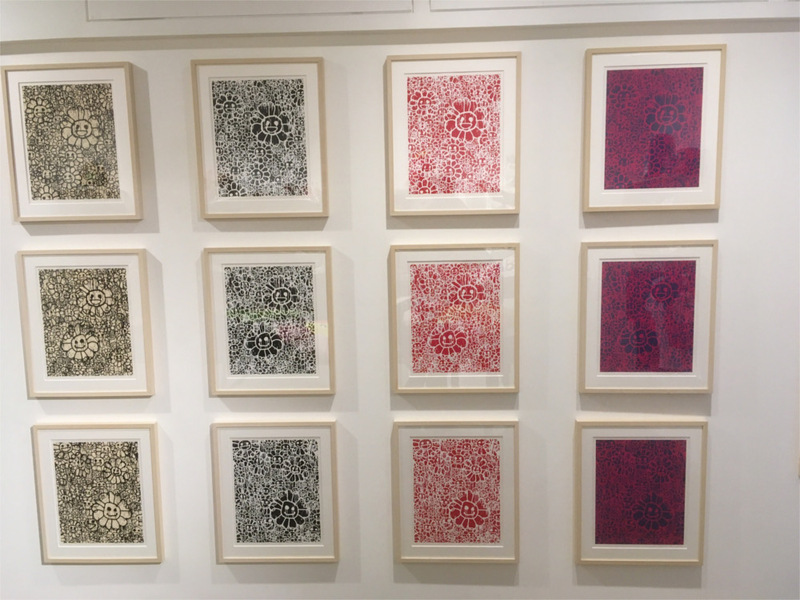 At the 2017 Complex Con in Long Beach California, Murakami released silkscreens of the Madsaki Flower motif in three colorways. Here, Murakami takes a few pages out of the graffiti handbook. He produces simple 3 and 4 color silkscreens—this is something new and arguably would have never happened without the Madsaki collaboration. Typically Murakami silkscreens involve hundreds of screens and a wide range of color applications and sell for thousands of dollars. While his earliest silkscreens may have been basic––now high end silkscreens from Murakami have become the norm. For Murakami to release a simple, elegant silkscreen series may be partly attributable to working with Madsaki. Also prints were sold on the day of the release—-this has not happened since the beginning of 2010 when Murakami’s Hidari Zingaro gallery first opened. Murakami released the Madsaki Flowers in the way Supreme might release new accessories––building hype and long lines in anticipation of the release consistent with the marketing of ComplexCon and typical graffiti art drops. The Madsaki collaboration licensed Murakami to move to a simpler, smaller print that could be readily produced and sold. Murakami replicated the same Madsaki Flower silkscreen sale with an additional colorway for Oz Zingaro at the end of 2017. Madsaki has perhaps become the most important Kaikai Kiki artist to date, even surpassing Mr. and Aoshima Chiho. Madsaki’s adaptation to the Kaikai Kiki factory work environment, along with his oversized influence on Murakami in extremely fruitful collaborations, mark Madsaki as a new giant in the art world.